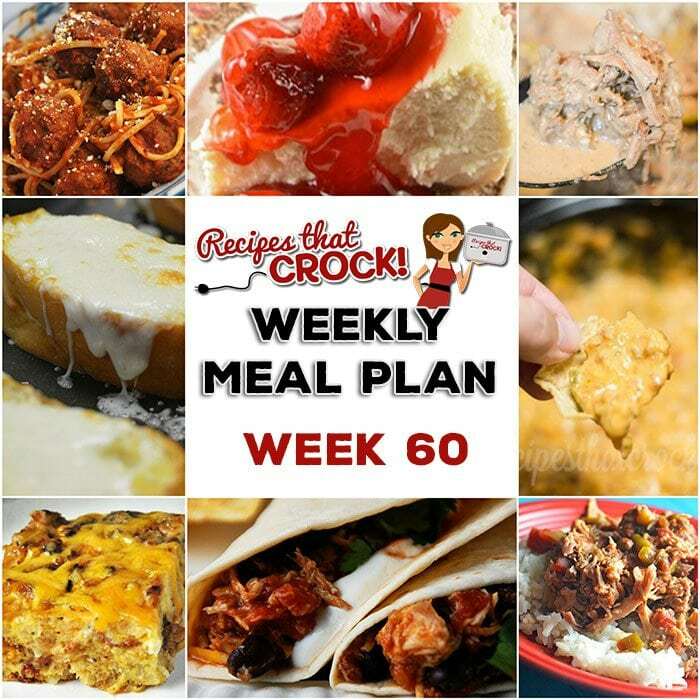 Meal Planning: Weekly Crock Pot Menu 60 - Recipes That Crock! This week’s weekly menu features Crock Pot Mississippi Beef, Crock Pot Tex Mex Chicken Tacos, Crock Pot Steak Mushroom Soup, Zesty Shredded Crock Pot Pork, Crock Pot Spaghetti and Meatballs, Mom’s Cheesy Garlic Bread, Crock Pot Sausage Cheese Dip, Homemade Crock Pot Cheesecake and Crock Pot Cheesy Bacon Casserole. Cris here. We had a blast with last week’s menu. We have a great line up again for you this week!